Today I did a wedding for an “encore” bride who is 23 years old. 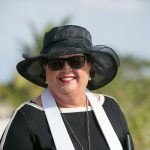 That was a bit unusual, most of my brides who are getting remarried are quite a bit older, maybe in their 40’s, 50’s or 60’s, although I once did a wedding for a bride who was 82 years old, and marrying her childhood sweetheart. That was a real love story. Engaged before World War II, they had been separated, married other people, and both spouses had subsequently died. Now they were getting married with their children, grandchildren and great-grandchildren around them. I must admit I have a soft-spot for encore brides. Whatever your circumstances, there has to be a lot of love and trust involved to take that big step a second, and sometimes a third time. Whatever your age, a second wedding should be just as beautiful, and perhaps even more meaningful than even the first. 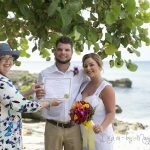 For this reason, I use different vows and a different ceremony for my “encore” couples. 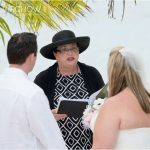 This weekend I did a beautiful encore wedding for a Scottish couple visiting Cayman. 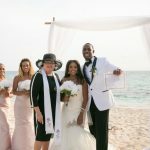 They were fortunate to be attended by a brother and sister-in-law, and to have a daughter, son-in-law and three adorable grandsons in attendance. Since I always have “wedding” bubbles for the children we had a great time with the bubbles, and the grown-ups enjoyed the “bubbly”. The bride was resplendent in a champagne cocktail length dress, with a matching lace and feather bandeau for her hair. She carried a hand-tied bouquet of champagne and cream roses. She looked very elegant, and could be the poster-girl for my idea of an encore bride.